Print Your Own Foot Massage Chart. 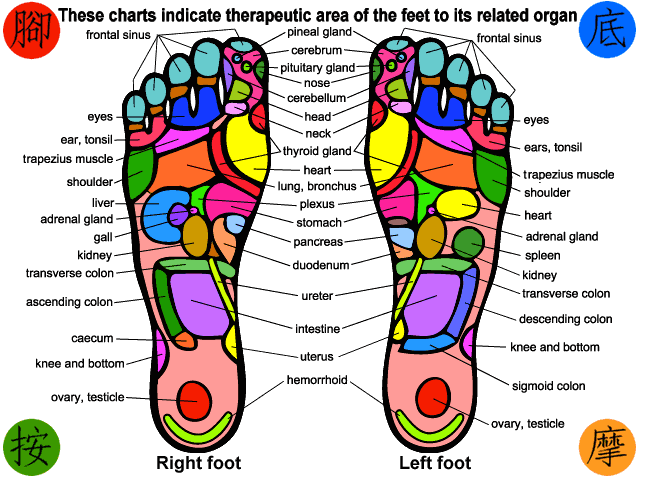 These charts indicate therapeutic area of the feet to its related organs. By stimulating one or a combination of areas, you will in turn be massaging the corresponding body muscles and organs. Foot massages are a simple and effective way to better health. According to Chinese Medicine, the foot is, in fact, a separate body, which is directly related to all of our body parts and organs. Your foot is divided into many different vital-energy sections, which can treat different areas of your body. By massaging a section of the foot, the corresponding body area receives specific therapeutic treatment. Foot massage can also be used to treat internal organ diseases, relieve internal discomfort, and relax your body.